The one thing that can be said for certain at this point about the stunning win of Dr. Ed Shadid over Charlie Swinton in Tuesday’s Oklahoma City Council Ward 2 race is that a conservative-driven and costly attack ad campaign against Shadid failed miserably. Perhaps, the attack campaign even created a significant backlash against Swinton, and a closer look at the specific precinct numbers in the days to come and other evidence-surveys, interviews, etc.-might support this argument. But this is a more tentative argument for now. Shadid, a local spinal surgeon, trailed Swinton, a banking lobbyist, in the first election among several candidates only to come back and beat him with 62 percent of the vote in Tuesday’s runoff election. Shadid collected 3,134 votes in the election. Swinton had 1,888 votes. That’s close to a landslide victory, and it seemed improbable that it would happen just a few weeks ago. There are many factors for the victory. 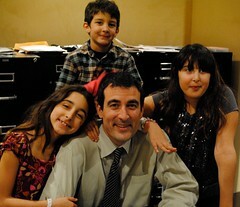 Shadid, pictured right with his children, is intelligent, eloquent and sincere. His supporters point to the energetic ground campaign, headed by Dwight Clark, and its grassroots nature. Shadid didn’t accept money from political action committees, and he made a point about it in the campaign. State Sen. Andrew Rice’s support for Shadid late in the race was also important. Brittany Novotny’s support was important, too. The campaign had significant support from the blogosphere and the social media network Facebook. Some political observers have suggested this might well have national implications in 2012. Could a small city council race here become a model for progressives in political districts with similar demographics? But a major issue in the runoff race was obviously the aggressive response by Shadid’s camp to attack mailers sent out to Ward 2 voters by the Committee for Oklahoman City Momentum, which received its funding from a group that by law doesn’t have to disclose its donors. Shadid made it a major issue in the campaign. (I wrote about the issue here. Momentum spent more than $400,000 on council races this year.) A group created by the Greater Oklahoma City Chamber, Forward OKC IV, donated at least some of the funding, according to chamber officials, but specific donors were not listed. A recent U.S. Supreme Court decision has allowed this type of secret but ultimately non-democratic political activity. The chamber economic development group, Forward Oklahoma City IV, donated money to one organization, which then gave it to Momentum, according to the report. As The Gazette pointed out, donors listed on the Forward Oklahoma City IV site include “Devon Energy, Love’s, the Chickasaw Nation, OGE, Sandridge Energy, Chesapeake Energy, American Fidelity Corporation, Oklahoma Natural Gas, Oklahoma Publishing Co. and Dorchester Capital.” But it’s unclear whether these companies directly contributed to the organization A Better Oklahoma City that then contributed the money to Momentum. In any event, it’s all apparently legal, but it seems like an obvious attempt to hide information from the public. The mailers depicted Shadid, who has run as an independent candidate in the past, as a caricature liberal while widely exaggerating and denigrating basic progressive ideas. Swinton is a Democrat, and the conservative-based mailers created somewhat of a split in the Democratic Party here, but a majority of voters of Ward 2 spoke clearly: We don’t want secret money influencing our local elections. We don’t believe Shadid is out of touch with our values. Here are some questions: How much did Shadid’s and his supporters’ aggressive responses to the mailers influence voters? Did the conservative, corporate power structure here simply overreach in Ward 2, which is home to plenty of liberals? Will Swinton’s apparent non-move to explicitly demand a stop to the mailers become its own wake-up call for Democrats in what few progressive districts remain in this state or even in more conservative-leaning areas here or elsewhere? The nation’s highest court in the 2010 Citizens United decision has essentially sanctioned secret campaign donations. Both conservatives and progressives can take advantage of the new system. Will Democrats emulate the Republicans in 2012 or stand up for open elections? This was the question here in Oklahoma City Ward 2, and the political answer is clear and encouraging. People want open and transparent elections. It’s a victory for democracy. « On Reincarnation, Or, Was Glenn Beck Just Promoted?